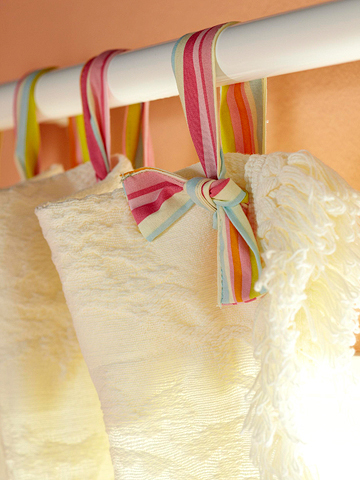 DIY Ideas For Hanging Curtains and Saving a Little Money too! 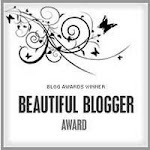 Hello, and Welcome back to LilacsNDreams! I just love DIY ideas, don't you? If I can use what I have at home, from thrift stores, second hand stores, and etc to give our home it's own character I will do it. I enjoy the low cost of doing this, and after saving money with some of these home projects it gives me more to spend some where else. Now, that is something I like! Above you will see a couple of pictures that I had found with Pinterest again. That place is really cool. So many ideas, and instructions being shared there it is very addictive. You could spend all day looking, looking, and doing some more looking to make some notes, or as many do bookmark things too. You should give it a visit some time if you haven't already. I will worn you though, it can be addictive. The first picture above is from DIYideas.com. What they did there was use some napkin rings, and some ribbon. They added to curtains of their choice, and made these. I like the idea of napkin rings as there is generally a good selection of those in colors, shapes, sizes, designs, and etc. Ribbon is always a good touch to add to many things. With this method you could be creative as you can with the picture below it too. That second picture came from bhg.com. Another good place to find some ideas that are shared too. With these curtains they used to make a ring for them they used ribbon only, and tied a little bow to them. 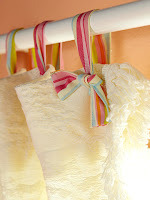 Great concept as you could use any color of ribbon, texture, and design. What is great with this method of doing curtains is when you feel the need for a change you won't always have to change your curtains. 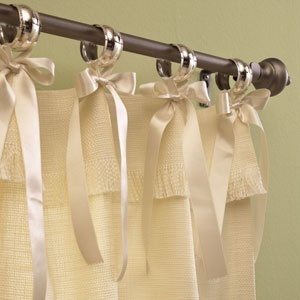 Instead you could just change the ribbons being used, change the napkin rings, shower curtains rings, and you get the picture. So, for those who like to do their own thing at home, save a penny or two doing it, this is another method of adding to your list of to dos, list of ideas, and all those wonderful notes that we all make for ourselves. I hope you enjoyed this idea shared with you, and that you find it helpful with the dressing of your homes. Hey, if you have something else that you use it would be great to hear about it, and we would enjoy having you share it here with all of us too. 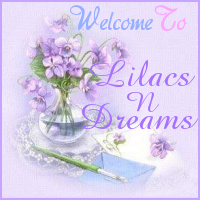 Thanks so much for sharing your time with LilacsNDreams everyone. Hope you enjoyed the visit, and it would be great to see you again. 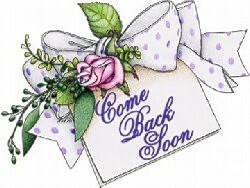 Take care till the next time!